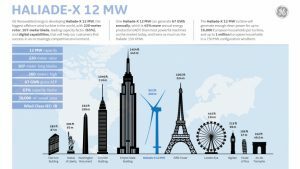 The new wind turbine, whose launch was announced yesterday in Paris, will produce 45 per cent more energy than the current largest turbine available. Each unit is claimed to have the ability to produce 67GWhr of energy per year, sufficient to power up to 16,000 typical European households. 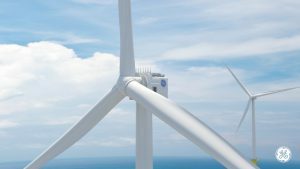 Its large size will enable offshore wind farm operators to reach their power goals using fewer wind turbines, thereby reducing capital expenditure, risk in project execution and simplifying maintenance and operation. 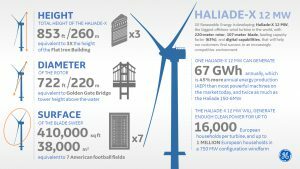 The Haliade-X is a truly enormous beast, towering 260m above sea level. In keeping with the location of the launch, GE stated that it is five times the height of the Arc de Triomphe; British readers may not realise that the Arc de Triomphe is roughly the same height as Nelson’s Column. More comparisons with well-known buildings can be seen in the infographic above. Each blade of the turbine is 107m long, making a total rotor diameter of 220m. The blades were designed, and will be manufactured, by LM Wind Power, a Danish blade specialist acquired by GE in 2016, which manufactures in Europe, North and South America and Asia. GE is to invest $400m in developing and deploying the Haliade-X over the next three to five years, and anticipates that the first deployment could be in 2021.